The Ankara Governor’s Office has banned all gay festivals, screenings, forums and exhibitions on security grounds, according to the BBC news. The announcement came only several days after the German LGBT Film Days which was due to run on 16-17 November in Turkish Capital Ankara, was banned by the governor’s office over “possible incitement of hatred and hostility among people”. LGBT groups in Turkey seem to be having difficult times due to ever-increasing political pressure. This is not the first time and LGBT activity was banned by the Turkish government. 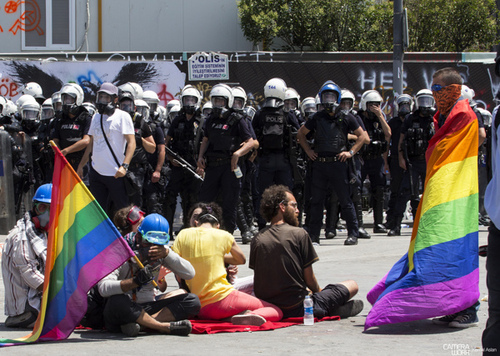 Early in June, the İstanbul Governor’s Office banned an LGBTI pride parade scheduled to take place in Taksim on June 25, citing security and public order concerns. “The application for the parade was not properly submitted to our office in accordance with Law 2911. There is also serious criticism of this parade from various segments of society on social media,” said the statement issued by the governor’s office. The ban came days after the Alperen Ocakları, an offshoot of Turkish nationalist movement the Grey Wolves (Ülkü Ocakları), announced that they would not allow LGBTI members to hold the pride parade. “Even if the government permits it, we will not let them walk,” said Kürşat Mican, Istanbul head of Alperen Ocakları during a program on KRT TV. “Wherever they walk, we will go there and block the street. They can come there,” added Mican, who stood trial for threats against LGBTI members ahead of the pride parade last year.